Car people know: When it comes to making a statement, it’s all about the classics. Can you imagine Ferris Bueller “borrowing” anything but a 1961 Ferrari? Or Steve McQueen car-chasing in anything but the green 1968 Bullitt Mustang? How about ZZ Top stepping out of anything but the 1933 Ford Coupe? And who can forget Vin Diesel shredding the road in his 900-hp, 1970 Dodge Charger at the end of The Fast and the Furious? Restomod is restoring a classic and adding newer parts to make it the perfect daily driver. (Jay Leno really made it popular.) We mod your engine or transmission – or anything you need – to make your car look like the classic, but perform like a new vehicle. Anybody can find old parts to mod your classic. We take every piece of your classic, strip it down, and powdercoat it in our special rotisserie powdercoating room. That means every piece of your car will last forever—no rust, no worries. That’s why we can offer a lifetime guarantee: Think of it as permanently sealing your classic. We took a ’67 Ford GT350 clone Shelby Fastback, and in six months, we stripped it down, and redid the body work, paint, suspension and interior. That job at the popular shop Mustangs 2 Fear takes three years, and costs $140,000. We took six months, and the total cost came in under $50,000. I don’t know anyone who’s done that kind of work that fast—with a lifetime warranty. Right now, everyone wants the Ford Mustang Fastback—especially since Carroll Shelby died. We know where to find them, and how to make them street-ready. Classic Camaros and Chargers are really hot too. 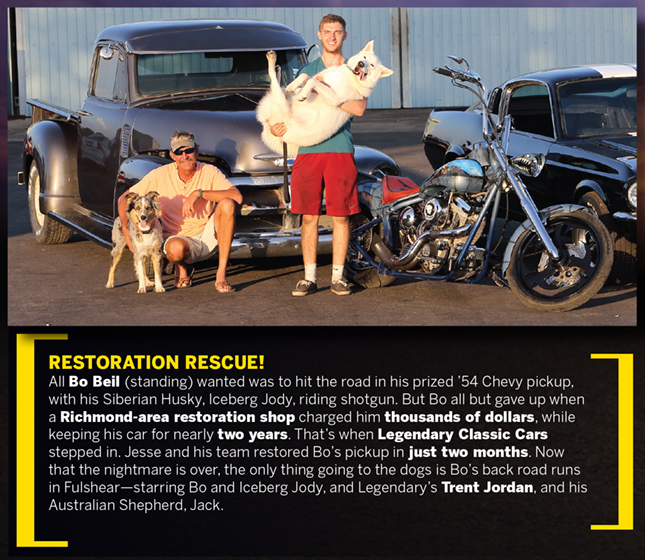 And we’re always restoring classic Ford pickups. About 60 percent of my calls are people who have vehicles at other shops that just aren’t getting worked on. These people have sunk a lot of money into their car, but nothing’s happening. I’ll examine the car, give you a fair estimate, and take it over and complete it—usually in less time than it’s been sitting. The best part: You don’t pay until you see progress. We’re flat-fee: We don’t do hourly charges, and we don’t charge upfront. We’re a one-stop shop: My brother “Boo Boo” and I scour the whole world looking for Porsches, Ferraris, Mercedes, and anything here at home. We’ll acquire that classic and restore it. All you have to do is drive. You do this as long as I have, you hear some crazy stories about family cars in garages netting millions. That’s because classics only increase in value. I’m a car guy, so I love seeing people’s dreams come true when we unveil their baby and they drive it away. But I also love hearing how happy they are with the investment. I don’t want to get into trouble, but let’s just say I’ve made a lot of folks a lot of money! Your one-stop shop for locating, acquiring and restoring your classic dream car.